The growth of the ninja warrior gym has been exponential over these past few years. People are looking for new ways to exercise and stay active in a way that keeps them motivated and keeps their attention, and these gyms do just that. What makes them so enticing to many different types of people of all ages? Here’s what our ninja warriors in training have to say about our ninja warrior gym in Minneapolis — Five Star Ninja Warrior. Many sports out there are great for the legs and for cardio — basketball, football, and soccer will keep kids running and pumping blood through their veins. While these are all great activities, they don’t come anywhere close to the exercises you subconsciously perform while training on obstacle courses in a ninja warrior gym. Throwing a ball will certainly keep your muscles loose and limber, but nothing compares to the amount of upper body strength you gain from successfully mastering different pieces of an obstacle course. This is why many people are choosing to enroll in our ninja warrior gym along with their children for a fun sport to enjoy together that offers unmatched fitness benefits and results. In just about every gym you’ve ever been to, you’ve likely come across a few “gym heads” or overly enthusiastic and competitive fitness junkies that seem to take over the gym and ruin the environment for everyone else. At our ninja warrior gym, there is no competition; everyone is simply working together to do the very best they can when tackling each and every obstacle. It’s more of a battle against yourself to constantly improve rather than a competition or comparison to other members. This serves as a great fitness environment for adults wanting to escape the gym hotheads as well as a great learning environment for kids to grasp the fundamentals of teamwork and sportsmanship. As long as you are trying your best, you don’t fail. Even if you just decide to enroll your child in our ninja warrior gym, you are more than likely going to get an itch to try some of the obstacles for yourself. Why? Because it’s a professional playground, bringing out the carefree kid in all of us, while still whipping us into the best shape of our lives simultaneously. It really doesn’t get much better than a ninja warrior gym, but hey, maybe we’re a little biased. 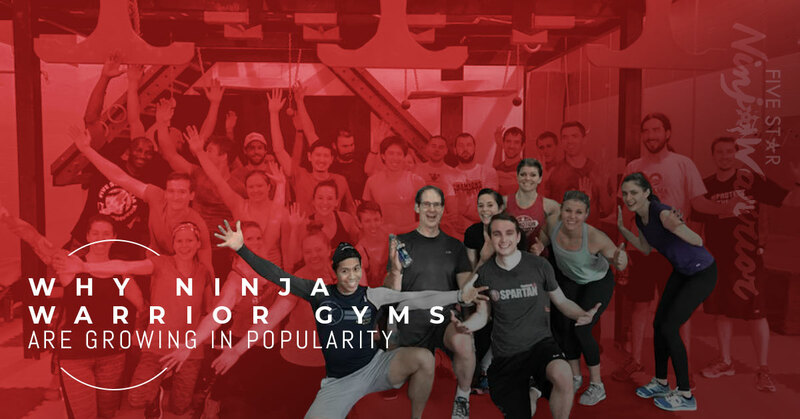 Interested in getting in on the fast-growing fun of ninja warrior gyms? If you are in the Minneapolis or St. Paul area, Five Star Ninja Warrior has two convenient locations for you to give obstacle course training a try. Sign up now to get your first five class for 50% off or reach out to us if you’d like to learn more information about what all we offer at our Five Star Ninja Warrior gyms.